I first learned about fava beans when I was 14. Not because I ate some, but because a notable psychopath liked to enjoy them with liver and a "nice chianti." I get chills thinking about that movie, which I got for Christmas last year. I decided it was time try Mr. Lecter's favorite legume for myself. 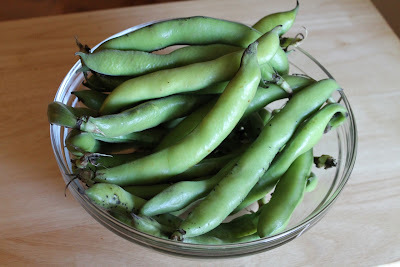 Fava beans are not particularly common, as they are available only seasonally and require quite a bit of labor. Shelling the beans is a two-step process: first, you have to remove the beans from their large pods, which is pretty much like shelling peas or any other bean that comes in a long green pod. 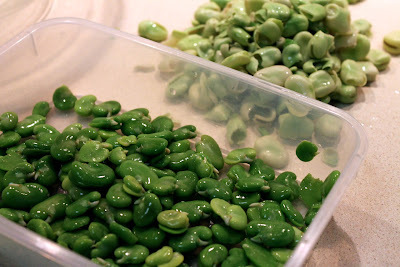 Then, after blanching, the beans outer light green casing has to peeled off to reveal the smaller light green bean on inside. This last step is the hardest to get the hang of. The thing that worked best for me was to hold the bean from the end that was connected to the pod and pinch the other end with my finger nails until the skin tears through. Then I gently squeezed the bean through the opening I'd made. The other challenge with fava beans: buying enough. Because of the two-step peeling process, they lose a lot of bulk. 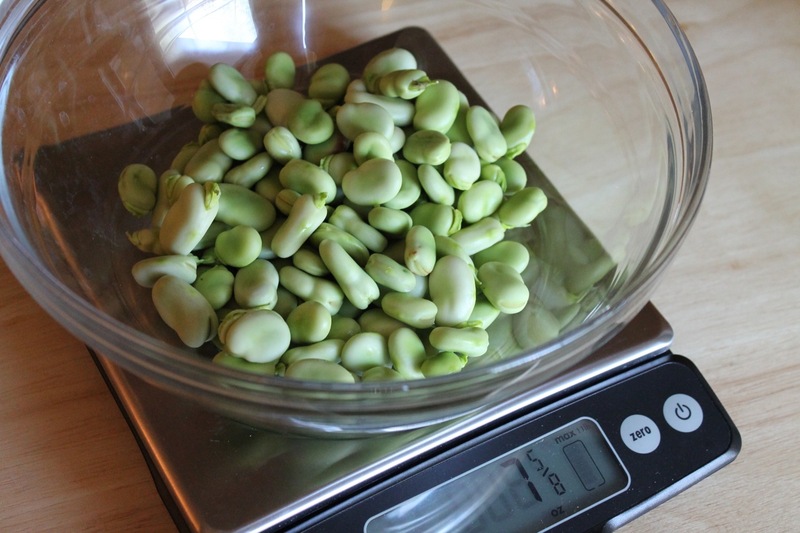 I thought I had bought what seemed like a lot of beans: about 32 pods, which filled a produce bag at Whole Foods. When shelled, it was about 1/2 lb. of beans. In the end, after peeling, there wasn't even a cup. Despite these challenges, the beans were quite delicious. Somewhat like lima beans but with a smoother texture and more robust flavor. I'd definitely buy them again, despite the prep work. Makes a good Sunday afternoon activity. Fava beans, mint and pecorino romano are a classic combination. To that, I added some fried shallots for a little crunch and served this as a side dish to broiled halibut with herbs and butter. 2. Heat the vegetable oil in a medium saucepan over medium heat. When hot, add the shallots and fry until lightly browned and crispy, about 4-6 minutes (watch carefully to prevent burning). Transfer cooked shallots to a paper towel-lined plate to cool. 3. Whisk together the olive oil, vinegar, parsley, salt and pepper. 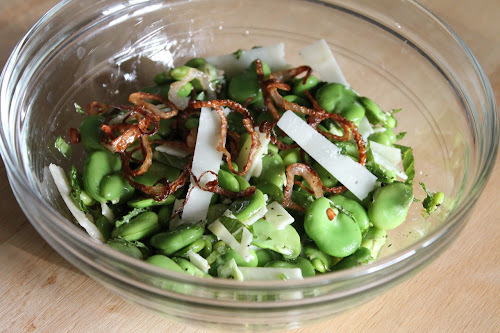 Add dressing and mint to the bowl with the fava beans and toss to coat. Serve beans topped with the fried shallots and shavings of pecorino romano cheese. The time of year when we get to eat dinner on the balcony is here. The arrival of spring in D.C. has been rather odd this year. It came with a bang a few weeks ago when temperatures soared to nearly 90, then it got quite cold. We seem to have finally reached an equilibrium of "nice" days, which is about the best time of year in the city. Regardless, the beautiful sunny days have put me the in mood for warm weather food, and one of the best out there is watermelon. That may seem like a summer fruit, but it pairs nicely with spring flavors, such as fresh watercress and, my herb of the week, mint, which also goes great with prosciutto for a refreshing, slightly sweet, slightly salty combo. With all these flavors, the dressing doesn't need to be very assertive. I used a mild combination of olive oil, lemon and honey. For the goat cheese, I wanted something harder than chèvre and found this cabra lamancha at Whole Foods, a cheese produced by Firefly Farms in Maryland and aged longer than other goat cheeses. It also pairs nicely with the prosciutto. 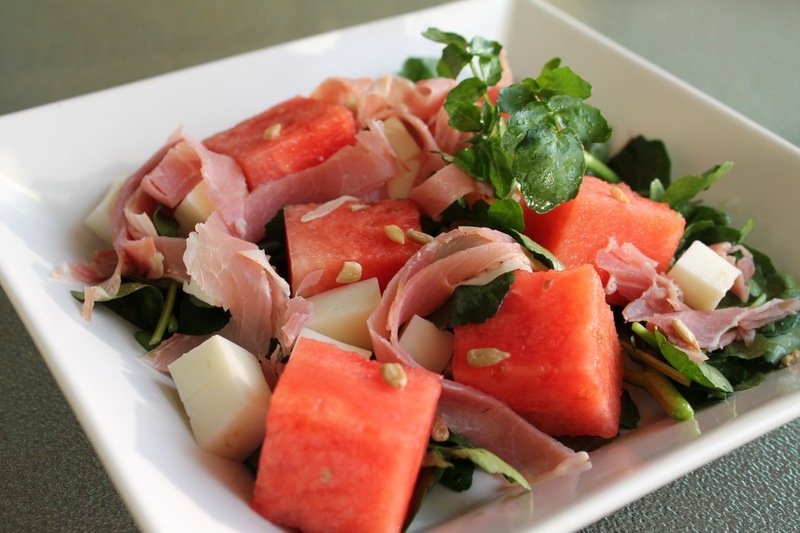 Combine the goat cheese, prosciutto, watercress, watermelon and mint in a large bowl. Whisk together the olive oil, lemon juice, honey, salt and pepper. Pour dressing over salad and toss gently to coat. Serve topped with a sprinkle of sunflower seeds. If basil is the taste of summer and sage is the taste of fall, I consider mint the quintessential spring herb. And it's one of my favorites. 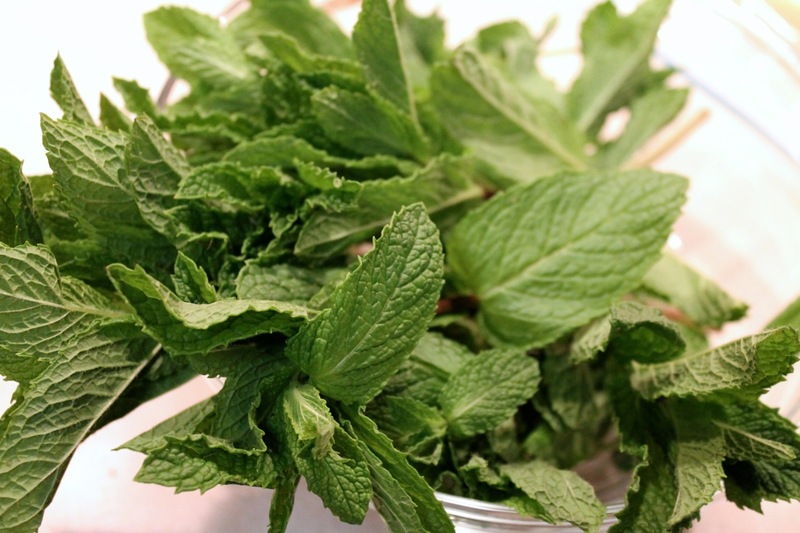 I love fresh mint year-round in salads, entrees and cocktails. This week I'm featuring a number of mint dishes to enjoy during every meal course. Today I have a Watermelon and Watercress Salad with Prosciutto and Mint. Coming up I have Fava Beans with Shallots and Pecorino, Pasta with Mint Pesto, two classic mint cocktails (Mint Julep and Mojito) and, possibly, a minty sweet dessert to finish the week (Mint-Chocolate Chip Ice Cream). 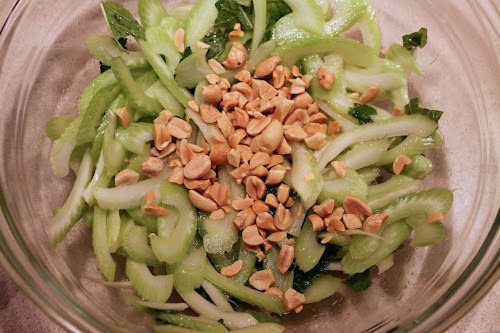 Salads: Vietnamese Chicken, Pea and Mint Salad finds the herb paired with other Asian flavors, Celery and Peanut Salad turns the classic celery stick and peanut butter snack into a salad, Shaved Salad with Honey-Smoked Almonds and Lemon Vinaigrette tosses mint with raw shaved zucchini, and mint adds a nice flavor to Wilted Spinach and Bacon Salad. Entrees: Asparagus and Snap Pea Pasta pairs mint with favorite spring vegetables in a great pasta dish, and Salmon with Tomatoes and Zucchini "Spaghetti" finds the herb flavoring a faux pasta. Cocktails: The Django Unchained is an irreverent fiery take on the mint julep inspired by the recent film, and The Backyard cocktail was inspired by my childhood backyard, including mint and juniper. Gin is an undeniable classic, and it's getting a modern makeover by American small-batch distillers pushing its typical juniper-botanical flavor profile in new and interesting directions. We recently sampled a selection of gins by small American producers and were struck by how different they were, each with a unique taste. Our sampling was done with our favorite household cocktail: the classic Gin & Tonic, a simple, refreshing drink that's welcome at every season. Each gin was paired with Fever Tree tonic (in a 1 gin to 2 tonic ratio) and a little squeeze of fresh lime juice stirred with ice. Dry Fly Washington Dry Gin, Dry Fly Distilling, Spokane, Wash. The drink made with Dry Fly had a clean taste with fruit notes. The gin played well with the lime, almost like tequila. The bitterness came forward as we drank it, but it was still quite a pleasant G&T. Bluecoat American Dry Gin, Philadelphia Distilling, Philadelphia, Pa.
After Dry Fly this taste more like a typical gin, with stronger spice notes. While drinking Dry Fly I noticed the lime more. With Bluecoat, it's the tonic that was more obvious. Although I liked both gins, I think I prefer the Bluecoat just a bit, since I gin with a spicier botanical profile. 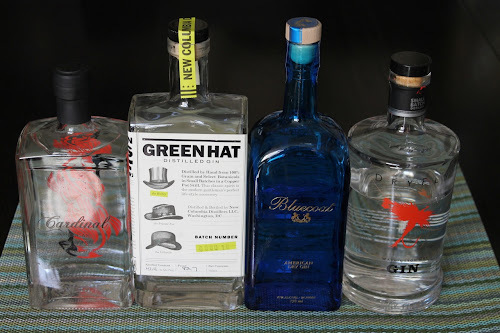 Green Hat Distilled Gin, New Columbia Distillers, Washington, D.C. Strongest odor. Unusual taste--hard to pin down. I'd say it's almost grainy, while Chris says it tastes like candy and added that he liked it the least. More similar to Dry Fly than Bluecoat. While not bad, there's something "off" about it that I can't quite put my finger on. I read that some have suggested it smells and tastes like buttered popcorn, which Chris agreed with. Cardinal American Dry Gin, Southern Artisan Spirits, King Mountain, N.C.
Cardinal gin has a bit of vegetable flavor; like cucumber, Chris suggested. Among these gins, it had the most pronounced juniper flavor and a nice slightly minty aftertaste. Definitely a nice gin. It's a difficult choice to name a favorite. Sadly, I can't say it's Green Hat, which I was hoping to love since it's homegrown, but it's unusual flavor made the G&T a little off-putting (I do hope to find a cocktail that will showcase it). Although I liked all the other three, I'd probably pick Bluecoat as my favorite, while Chris said Cardinal's cucumber flavor made that spirit his pick. We both chose Dry Fly as a close second. Combine gin and tonic water in a rocks glass with ice. Squeeze lime over drink and drop in. Stir to combine. The current food literature has made it abundantly clear: we need to get back into the kitchen. And not to use our microwave to reheat frozen entrees or our pots to reconstitute dried packet meals, but to re-learn how to turn basic raw ingredients--vegetables, fruits, grains, lean meats--into healthy, tasty meals. We've allowed convenience foods, once viewed as an occasional indulgence, to become the centerpiece of our dining room table (if we're even bothering to transport the meal to the table). We've done so at our peril. 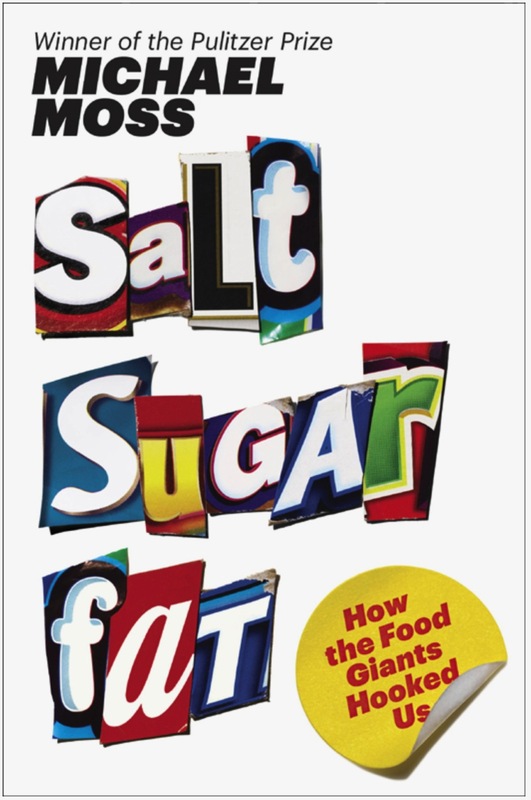 Michael Moss effectively critiqued the convenience food industry in Salt Sugar Fat--an industry that thrives on our perception that we lack the time to really cook. While that may often be true, sometimes I think people choose not to cook because they don't know how. If our parents didn't cook and we attended schools where home economics was no longer taught, it's no wonder some people can't tell a whisk from a spatula. Michael Pollan's new book Cooked is all about getting back into the kitchen. For a lot of families with two working parents and multiple children in different schools, dinnertime can suffer short shrift, if it happens at all. As commutes gets longer and more car time is added on to shuttle kids from school to soccer practice to piano lessons, etc., families spend less time in the kitchen making nutritious, tasty meals. It's no wonder the convenience food industry has blossomed with promises of quick, easy meals, but we are paying the price for that tradeoff, as obesity rates, and related illnesses, continue to rise. 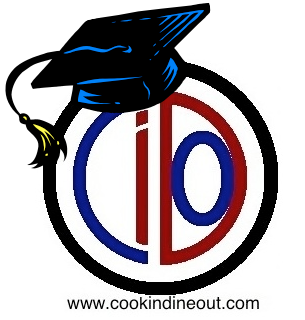 Cook In 101 is a new occasional feature targeting novice cooks to help them break the convenience food habit and get them back into the kitchen making real food. Since I see the cooking knowledge gap as one of the primary reasons people aren't cooking, Cook In 101 recipes will be simple and take time to thoroughly explore the cooking techniques used in the recipe. If we can demystify the difference between julienne, dice and mince, I think we're a good ways towards helping people realize it's just as easy to cut up and sauté a couple of fresh vegetables and serve it over brown rice as it is to boil water and dump in a packet of who-knows-what loaded with salt, sugar and ingredients of questionable pedigree. For my first Cook In 101, I worked with a friend, a working father of two, make Spaghetti with Meat Sauce from scratch, a recipe that takes about 30-40 minutes. For my first Cook In 101, I partnered with my friend Rich. He faces the kind of dilemma that keeps many families away from the kitchen. He and his wife work full time and they have two kids that attend different schools with multiple after-school activities. Although his wife is an excellent cook, to address scheduling needs, he's the one who gets home earlier. They have a beautiful kitchen, but like many people, feel the crunch of time and the need for ease when it comes to meal time. So he asked me for help in developing some kid friendly dishes that would be fast and easy to make but use real fresh ingredients. For our first meal, I thought about spaghetti. Commercial spaghetti sauce is a big seller, but it's also loaded with calories and other evils of the food processing empire. Sugar is the fourth or fifth ingredient in many popular brands of pasta sauce, no doubt because the sweeter sauce is more popular with kids and sugar masks the inferior quality of other ingredients. These sauces also have a lot of salt. And here's the rub: they don't save very much time. It takes about 20-25 minutes to cook dried pasta, if you factor in the time to boil the water. By adding just 10 more minutes to that, you can make a much tastier homemade pasta meat sauce with much lower fat and salt and no added sugar. This recipe is based on my favorite spaghetti sauce, an adaptation from what my mom made when I was a kid. Our spaghetti sauce never came from a jar and when you can make it this good yourself, it's no wonder. The ingredients are limited and easy to come by: dried pasta, ground meat, canned tomatoes (diced and paste--look for low-sodium varieties), fresh onion and garlic, a couple common dried herbs and grated parmesan. Top view of an onion half (with root): first make the blue cuts, then, starting from the outside and working in, the red cuts to dice an onion. Holding the onion by its root and stem ends, cut the onion in half through its "equator." Using your fingers, peel off the dry skin and thin outer layers, keeping the root and stem intact. Place the first onion half cut-side down on a cutting board. With a chef's knife, make a row of parallel cuts along the bottom of one half of the onion, as shown by the blue lines in the figure above. 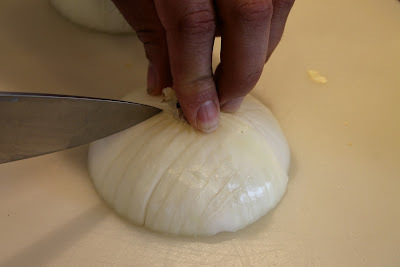 Then, starting from the outside and working in, make cuts across the lines as shown by the red lines, making additional cuts on the sides as needed to finish dicing the onion. Repeat with the other half. I also showed him how to peel garlic cloves by smashing them slightly with the side of a chef's knife and slipping the peel off. 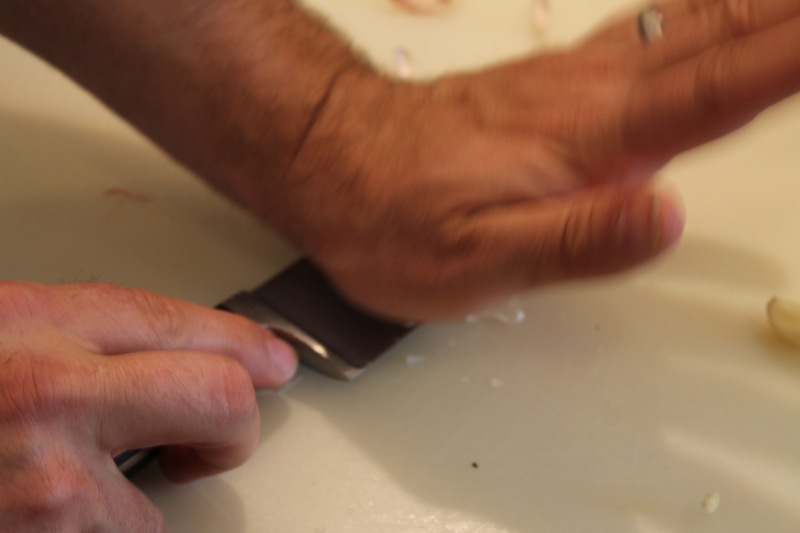 I use a paring knife to cut off the rough spot where the clove connects to the head before mincing the garlic, that is chopping it finely into pieces about 1/8-inch. 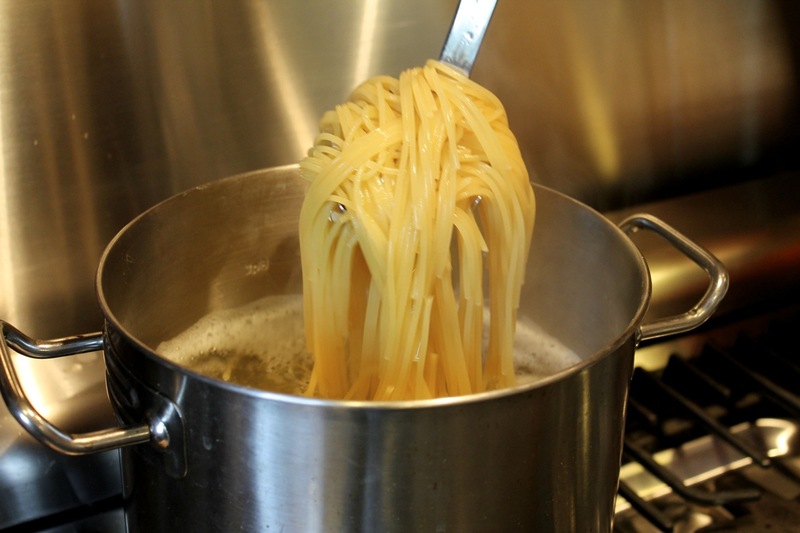 The pasta needs a large pot to cook properly. For cooking a pound of pasta--the amount in a standard-size box--you'll want to use about a gallon (4 quarts) of water. 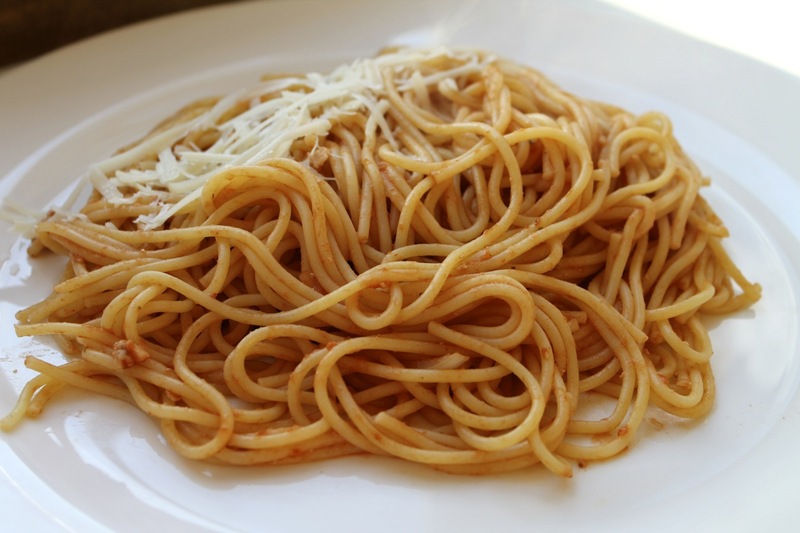 Although pasta will cook in less water, using less water increases the water's concentration of starch that seeps out of the pasta as it cooks, which can make the pasta stick together. Stirring the pasta occasionally with a pasta spoon also helps keep the noodles from sticking together. Some people add oil to the pasta cooking water to help with this, but I recommend against it because coating the pasta with oil means that the eventual sauce that you'll toss the pasta with won't adhere to the noodles as well. I do recommend adding plenty of salt to the water, about 2-3 teaspoons. If you're concerned about sodium, remember that you won't be eating all or even most of that--it will stay in the cooking water, most of which is discarded--but the concentration is important for giving the pasta adequate flavor. Unsalted cooked pasta is rather bland, even when sauced. When deciding how long to cook pasta, consult the package directions and aim for the shorter cooking time, which is typically recommended to make the pasta "al dente," an Italian word for "toothy" that describes perfectly cooked pasta: chewy, not too soft and no longer hard. If you'll be cooking the noodles for additional time in the sauce, undercook the pasta a bit so that it will reach al dente while in the sauce. Drain the pasta in the sink by pouring the entire contents of the pot into the colander (be careful not to pour too fast). If the sauce is still cooking, I put the pasta back in the pot with a little bit of the pasta cooking water (like 1/4 cup) and put the lid on it. Reserving a bit of pasta water is also useful for thinning out the pasta sauce if it gets too thick while cooking. 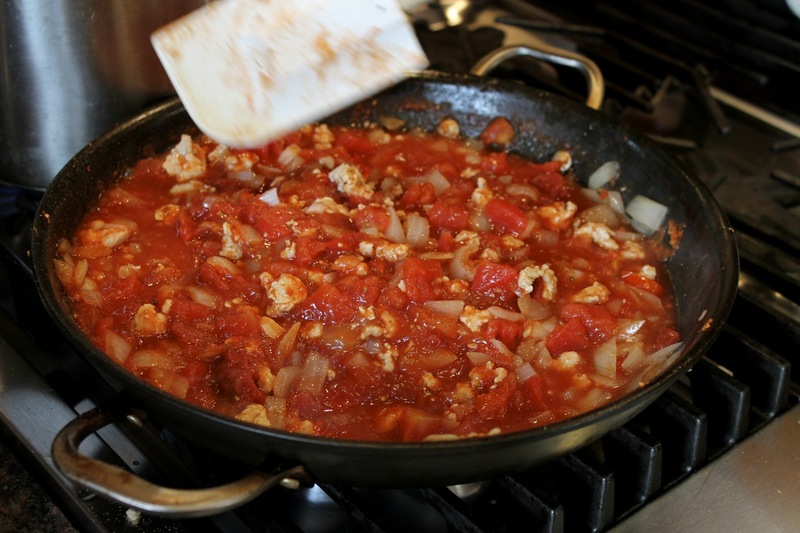 When making the sauce, be sure to use a pan large enough to easily contain the ingredients and allow stirring withing sloshing out the side of a pan. An enamel dutch oven or large saute pan with steep sides work well. A large (12-inch) frying pan also works but requires a little more care. The princinpal method of cooking the sauce ingredients is saute, a basic, easy and often-used technique to cook ingredients over moderate heat in a little oil. It's important to keep the food moving, not constantly, but frequently while sauteing to promote even cooking and prevent over-browning from allowing the surface of a given piece of food to remain in contact with the pan continuously for too long. When making a recipe like this pasta sauce, don't worry too much about measurement. Unlike baking, this kind of cooking does not require precision. If you really like garlic, feel free to add more. If you don't care for oregano, use less or omit it altogether. Other vegetables could certainly be added this sauce, such as celery, bell pepper, carrots and mushrooms. After simmering the sauce, be sure to taste it and add any additional seasonings if desired. Always taste your food before serving it. If you like it, there's a good chance others will too. If using ground beef instead of poultry, you may not need to add olive oil for sautéing the vegetables, since ground beef is higher in fat and will render fat during browning. If you don't use a lean ground beef, there may be too much fat and some should be removed (if you're only removing a bit, I often use a paper towel gripped with tongs, since pouring hot fat out of a large, hot pan can be difficult to do safely without making a mess). Equipment: large pot (6-8 qt. ), pasta spoon, colander (for draining pasta), cutting board, chef's and paring knives, pan (Dutch oven, saute pan or 12-inch frying pan), stirring tool (spatula, wedge or spoon--use wood, durable plastic or sillicone if your pan is nonstick), can opener. 1. Bring a large pot of salted water to boil. Good pasta according to package directions for al dente. Drain pasta and set aside in the pot, covered if the pasta finishes cooking well before the sauce is done. 2. Heat 1 tbsp. olive oil in large sauté pan over medium heat. Cook ground turkey until no longer pink (or ground beef until browned), breaking up with a spoon or spatula as it cooks. Remove meat from pan. Add remaining tbsp. of olive oil to pan. Add diced onion and minced garlic and sauté until softened, about 8 minutes. Add back the cooked ground meat and season the mixture with salt and pepper to taste (when seasoning "to taste," I recommend being judicious with the salt. Later, after tasting the sauce, you can add more, but it's not possible to "unsalt" food). 3. Add the diced tomatoes, tomato paste, oregano, thyme and water. Stir until ingredients are evenly combined. Once the sauce begins to bubble, cover the pan, reduce heat to low and simmer for about 10-15 minutes ("simmer" means to cook over low heat. The food should bubble just slightly. Because the heat is so low, it does not require frequent stirring, although occasional stirring is recommended. For a 15-minute simmer, I might stir the pot 2 or 3 times). 4. Combine the cooked pasta with the sauce and stir to coat evening. Serve the pasta on plates or in large, shallow bowls with the parmesan at the table. Washington City Paper: “Thank You For Sharing,” by Jessica Sidman. On the occasion of the recent ceremony naming April 9 “Jaleo Day” in D.C., Sidman reflects on the popular Spanish restaurant and its big-name chef Jose Andres’ influence in popularizing small plates, a.k.a. tapas, beyond their Spanish origins to encompass a service style that restaurants making all manner of cuisine have embraced. New York Times: “I Heart Artichokes,” by Mark Bittman. Bittman’s article, along with its great interactive graphic, 9 Ways to Make the Most of an Artichoke, explores various methods for cooking everyone’s favorite oversized thistle. I’d like to try them sautéed with anchovies and garlic. Sounds delicious. CNN: “Opinion: What the 'ag gag' bills mean to my farm,” by Ryan Goodman. Farmer Ryan Goodman of AgricultureProud.com is a great resource: a working farmer that writes about agricultural issues with an aim towards informing his down-the-line urban customers that have little or no firsthand knowledge of what actually goes on at a farm. My first reaction to so-called “ag gag” laws that seek to curtail undercover activism to expose harmful farm practices was that they should be opposed as a blow to consumer transparency in an industry that needs more oversight. However, Goodman’s story raises some good points about how the footage shot in the name of such activism may distort what’s actually going on and hurt small farm businesses like his own. While I still believe in undercover work in the food industry (Tracie McMillan’s The American Way of Eating is an excellent example of its value), Goodman’s op-ed makes a good case that such issues need a nuanced view and aren’t as one-sided as many would like. Smitten Kitchen: “Ramp Pizza,” by Deb Perelman. It must be ramp season: lots of food blogs are featuring them. For the uninitiated, ramps are wild leeks that resemble scallions but have redish bulbs. The have a very short season, so people tend to go a little nutty about them. I used them last year in a halibut dish with mushrooms, asparagus and pea puree. If I can find some this year, I’ll probably make this pizza, which looks absolutely divine and sounds amazing when you read Perelman’s description of what it’s like when it comes out of the oven. Delicious. It’s frustrating when certain popular restaurants won’t take reservations. Although my knee-jerk reaction is to think these restaurant must believe it’s cool to force patrons to wait 60 to 90 minutes for a table (OK, I still think some must feel this way), others just don’t want the hassle of no-shows, an increasing problem for the rest of us who always honor their reservations. McKeever explores five tactics restaurants are employing to deal with the problem, including, and I don’t mind this one at all, tracking prior offenders. Because greens like Swiss Chard wilt so nicely when sauteed with oil, I thought it might be an interesting component of a simple midweek stir-fry. Since chard can be a bit bitter, I wanted to balance that with the sweetness of orange, which forms the basis of the sauce in this dish along with generous amounts of fresh ginger and garlic. I love the color of this dish: the orange of the julienned carrots and peanuts nicely illustrates its flavor and contrasts with the dark green of the cooked chard. 1. Heat a large sauté pan over medium-high heat. 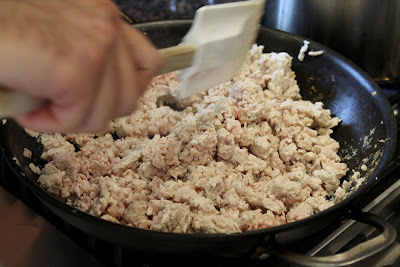 Add ground pork and cook until the meat is browned. Remove from pan and set aside. 2. Add 1 tbsp. of canola oil to pan. 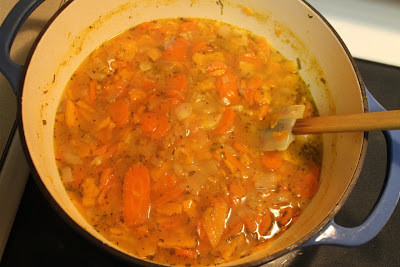 When hot (shimmering), add onion and carrot and sauté until softened, about 5 minutes. Add the chard and continuing sautéing until the greens have wilted, about another 3 minutes. Remove vegetables from pan and set aside. 3. Add the other tbsp. of canola oil to pan. When hot, add ginger, garlic, peanuts and red pepper flakes and sauté until fragrant, about 2 minutes. In a small bowl or a glass measuring cup, combine the orange juice, soy sauce, sherry, sesame oil, cornstarch and white pepper. Add to pan, stirring with the peanut mixture as the sauce thickens. Reduce heat to medium-low. Return cooked meat and vegetables to pan, stirring to combine with the sauce. Serve with brown rice. I’ve lived in the D.C. area for 14 years now, but there is a part of me that will always call Portland, Oregon home. It was a great place to grow up, and I take pride in the fact that it’s among the group of U.S. cities that elicit an “ah” rather than an “oh” when you tell people that’s where you’re from. It’s no secret that Portland has a wonderful food scene and has for a long time. For the fourth year in a row, three of the five nominees for the Best Chef Northwest James Beard Award are from Portland (and Portland took four of the five slots in 2009). I take a special pleasure in knowing that Portland consistently gets more nominations in this category than its larger neighbor to the north, Seattle (Portlanders are naturally competitive with Seattle; we can’t help it). When earlier this year people were declaring the Seattle food scene “in” and Portland “out” I thought “puh-lease.” You have no idea what you’re talking about. Naomi Pomeroy of Beast, nominated in this category in 2010 and 2012. Beast was named The Oregonian’s favorite restaurant in 2008. Gabriel Rucker of Le Pigeon, frequently named as Portland’s hottest restaurant. Rucker won the James Beard Award for Rising Star Chef in 2011. In 2010, he opened Little Bird Bistro, which the Oregonian named its best restaurant last year (Le Pigeon shared the honor with Beast in 2008), and which I had the pleasure to visit in September. Cathy Whims of Nostrana, who has been nominated several times in this category the last few years. Years ago she worked at Genoa, which back in the ‘90s I remember was frequently talked about as the best Italian restaurant in Portland. Unfortunately, apart from Little Bird, I haven’t gotten to try these chefs’ food in person. But I did recently get the chance to experience their talent, albeit indirectly. As luck would have it, all three chefs contributed to The Oregonian Cookbook: Best Recipes from FoodDay, edited by Oregonian FoodDay editor Katherine Miller. I received the book as a generous gift from one of my mother’s friends, a Cook In / Dine Out reader, and I thought there could be no better way to both dive into the book and celebrate Portland’s James Beard nominations than by cooking a dinner featuring all three dishes. First up was Whims’ Nostrana Salad made with radicchio, a Caesar-like vinaigrette and buttery herbed croutons. She soaks the radicchio in ice water for 2 hours, which mellows its flavor. I actually forgot to do this, so it got maybe 15-20 minutes of soaking, which was enough time to crisp it a bit, but I actually rather like its bitterness, so I didn’t mind. The herb croutons are really great. I made mine with a rosemary boule from Whole Foods. 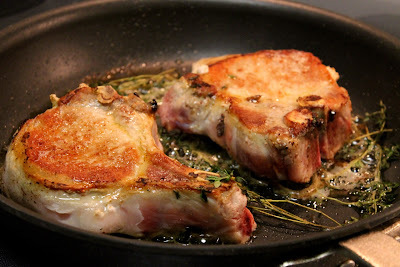 Next was Rucker’s Pan-Seared Pork Chops with Thyme and Bacon Crumbs. This is a simple, flavorful way to prepare pork chops. I love the bacon-flavored fresh breadcrumbs. Since I had to cook some bacon to render its fat, I tossed a few of the cooked bacon lardons into the Nostrana Salad. 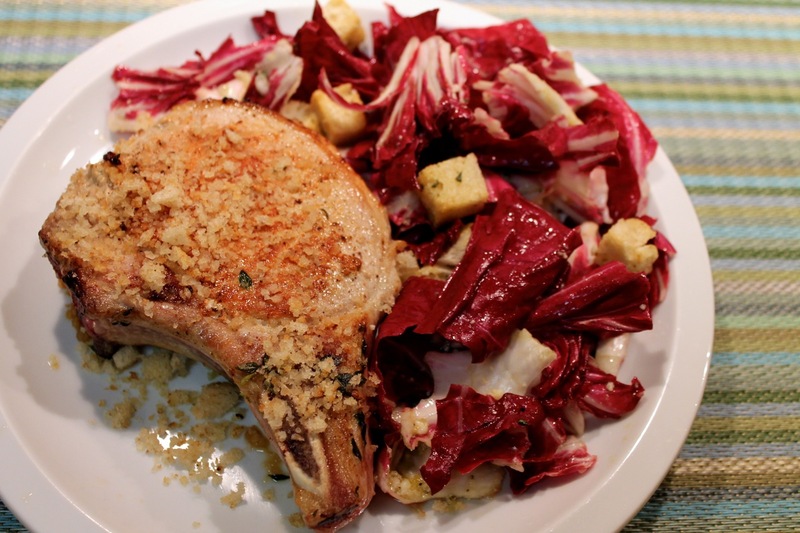 Be sure to use thick, bone-in pork chops for this dish. The thin, quick-cooking chops are actually challenging to cook well since they can become tough so easily. 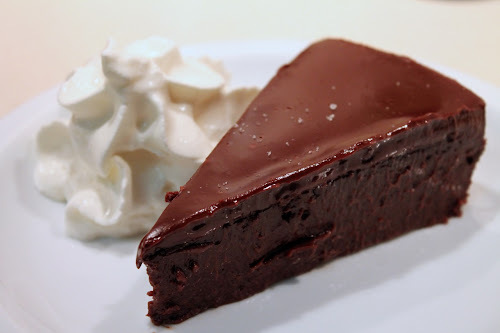 I finished the meal with Pomeroy’s exquisite Chocolate Truffle Cake, which was so divine, I’m giving it a separate post. 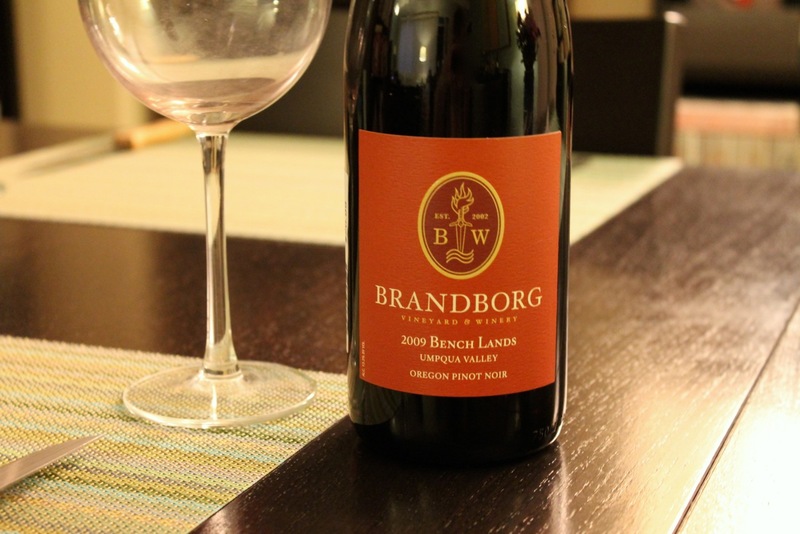 A meal of good Oregon chefs’ dishes calls for a good Oregon wine, and nothing says “good Oregon wine” like pinot noir. 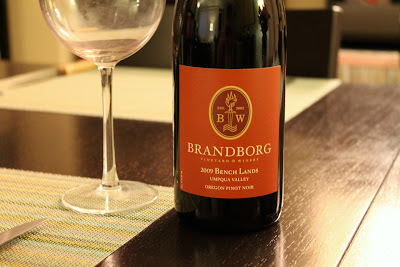 I opened a bottle of 2009 Brandborg Bench Lands pinot noir, which heralds from the Umpqua Valley, a southern Oregon wine region near where my dear Great Aunt Eva lived. The light, smooth pinot was a nice match for this dinner and a perfect way to toast the success of these great Oregon chefs. I found it at Cordial in Union Market. I wish them all the best of luck at the upcoming James Beard Awards on May 3. Note: I divided this recipe in half, omitted the (1 tbsp.) white wine and substituted about ½ tsp. of soy lecithin granules for the raw egg yolk. I also didn’t soak the radicchio in ice water for the full 2 hours, which would have made its flavor milder, but I like its bitter taste. 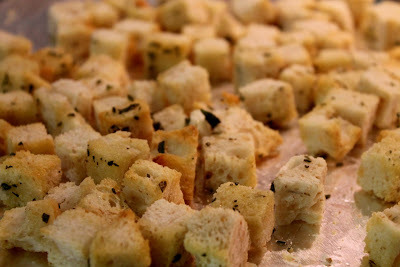 For the croutons, I used an organic rosemary boule, which was delicious with the radicchio. 1. 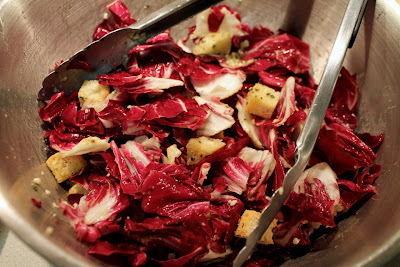 Tear the radicchio into 1 ½-inch pieces and soak in ice water while you make the croutons and dressing. 2. Preheat oven to 375 F. Bake the bread cubes on a large baking sheet until toasted all over, about 10 to 15 minutes. In a medium to large skillet over medium-low heat, melt the butter with the fresh chopped herbs until fragrant. Add the toasted bread cubes and toss to coat. Set aside to cool. 3. Smash the garlic clove then mash it finely with a pinch of salt in a mortar and pestle (lacking that, I use a 1-cup glass measuring cup and the rounded end of a cocktail muddler). Add garlic to a food processor (or blender) along with the vinegar, mayonnaise, anchovies and lecithin (or egg yolk). Begin processing then slowly drizzle the olive oil through the feed tube until the dressing is emulsified. Season to taste with salt and fresh-ground black pepper. 4. Drain the radicchio and spin it in a salad spinner to dry. Transfer radicchio to a large salad bowl and add enough dressing to coat it well. Toss to combine then add the croutons and a generous sprinkle of parmesan. Note: Like the Nostrana Salad, I divided this in half, since I was cooking for two. I didn’t make any other changes. 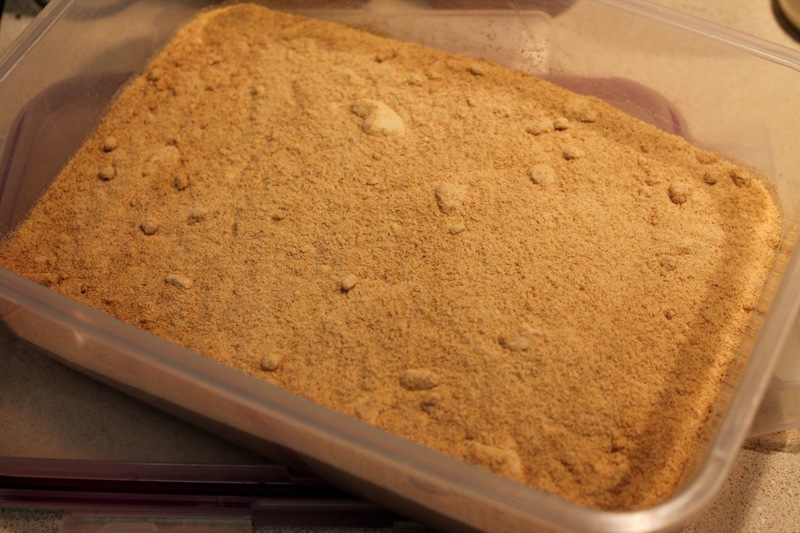 To make fresh bread crumbs, use slightly stale good-quality bread (I used a few slices of sourdough). Tear the bread into pieces and add to a food processor. Pulse a few times until the bread is reduced to crumbs. 1. In a small frying pan, heat bacon fat over medium heat until melted. Ad breadcrumbs, stir to coat with the fat and cook, stirring frequently, until crumbs are golden brown, about 5 to 7 minutes. Season with salt and pepper and set aside. 2. Pat chops dry with paper towels and season liberally with salt. In a medium skillet, heat oil over medium-high heat until hot (it should shimmer). Place the pork chops in the pan spaced apart a bit. Add the butter and scatter the thyme sprigs in the pan. Cook chops until well browned, about 6 minutes, then flip them over and continue cooking until lightly browned and cooked through to 140 F (medium), about 3 to 5 minutes longer (mine took a bit longer to reach temperature, but I also cooked through over slightly lower heat). 3. Transfer pork to serving platter, spoon some of the butter from the pan over the chops and allow them to cool for about 5 minutes. Just before serving, squeeze lemon juice over the chops and top with a handful of the breadcrumbs. I’m writing about Chef Naomi Pomeroy’s Chocolate Truffle Cake separately from the other recipes by Portland-area James Beard Award nominees because: 1) it’s amazing, and 2) it was my DIY birthday cake for this year. I’d never made a flourless chocolate cake before, but after making this one, which is quite easy, It’s hard to imagine I’d need a different recipe. The texture was superb: smooth but firm, like a thick custard that’s somehow hardened. 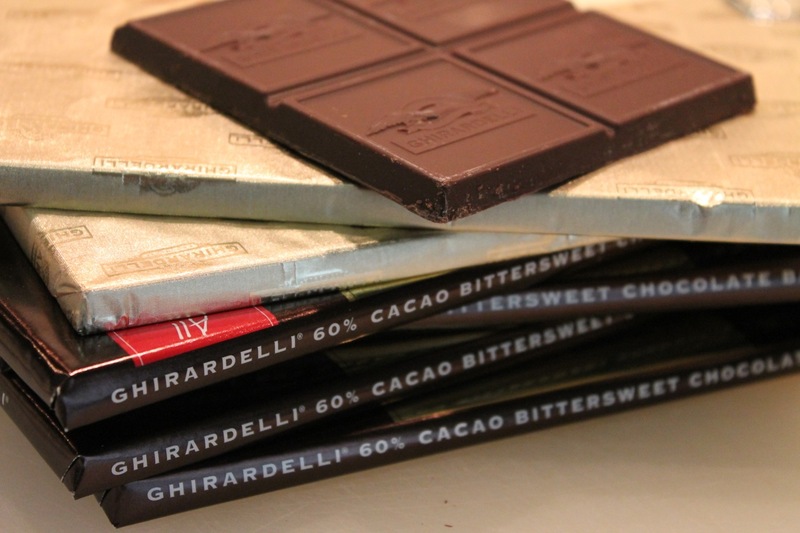 With all that dark chocolate (six and a half bars of Ghirardelli bittersweet), the flavor was pretty amazing too. Although it may seem strange to put mushroom flavor in a chocolate cake, the truffle salt provided a subtle savory note that nicely balanced with the cake’s sweetness. 1. Preheat oven to 350 F. Butter a 10-inch-diameter springform pan. Line bottom of pan with a round of parchment paper and butter parchment. Wrap outside the pan’s bottom and sides in three layers of heavy-duty aluminum foil. 2. Combine 1 cup water and sugar in a small saucepan. Bring to boil over medium heat, stirring until sugar dissolves. Simmer for 5 minutes. Remove from heat. 3. Melt butter in large saucepan over low heat. Add chocolate and whisk until smooth. Whisk sugar syrup into chocolate; cool slightly. Add eggs and 1 tsp. truffle salt to the chocolate mixture and whisk until well-blended. Pour batter into the prepared pan. Place cake pan in a large roasting pan. Add enough hot water to roasting pan to come halfway up the sides of the cake pan. 4. Bake cake until center no longer moves when pan is gently shaken, about 50 minutes. Remove from water bath; transfer to rack. Cool completely in pan. 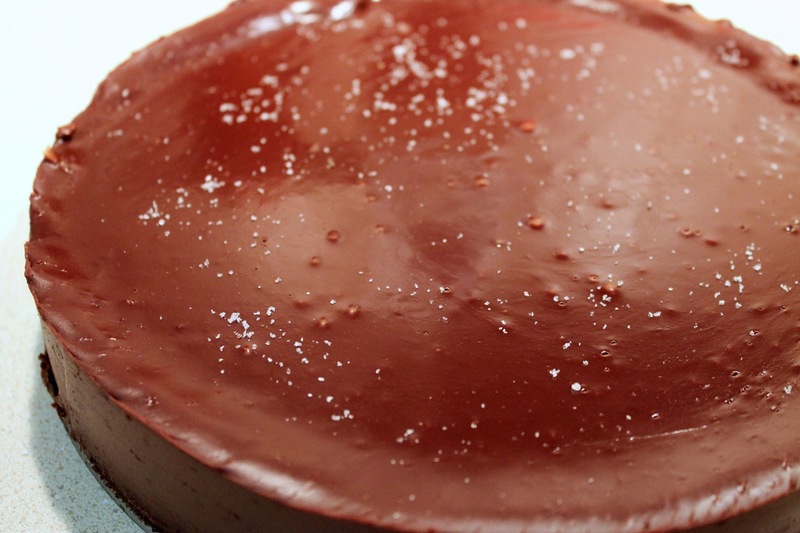 Sprinkle top of cake with a pinch of truffle salt. 1. Heat cream in a small saucepan over medium heat until it begins to simmer. 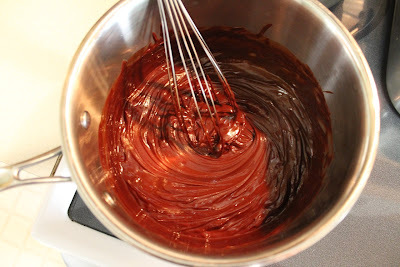 Remove from heat, add chocolate and whisk until smooth. Pour ganache over top of cooled cake still in the pan. 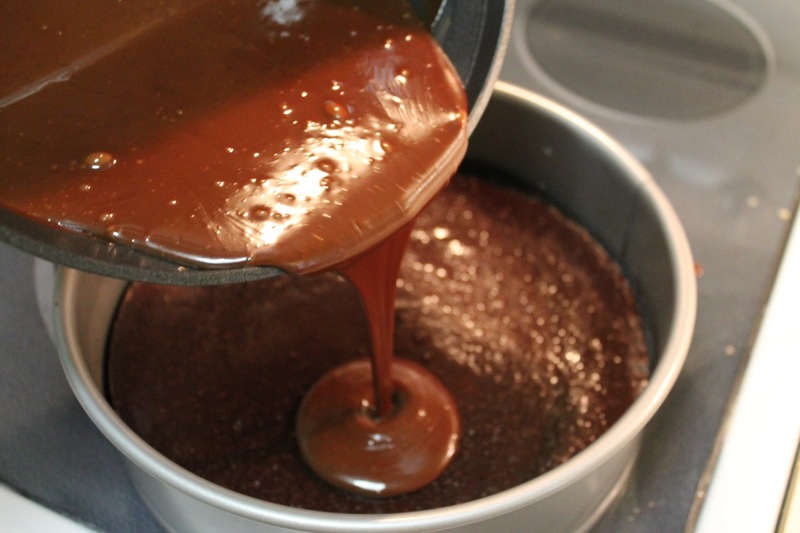 Gently shake pan to distribute ganache evenly over the top of the cake. Refrigerate cake in pan until ganache is set, about 2 hours. The cake can be made up to 2 days ahead. Cover and keep refrigerated. 2. Run knife around pan sides to loosen cake; release sides. Cut cake into wedges and serve with whipped cream. 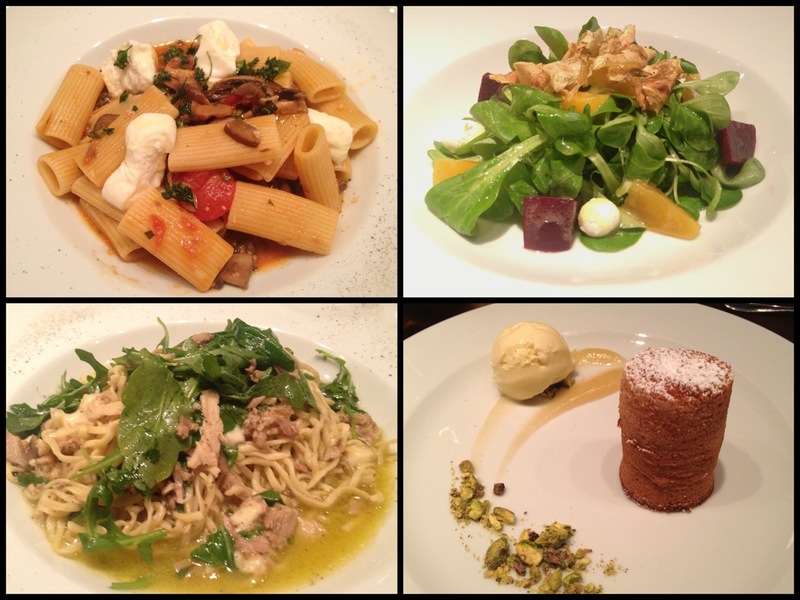 When Elisir opened a year and half ago, it was a formal white-tablecloth restaurant serving modernist Italian dishes. Judging by the photos of Chef Enzo Fargione’s work, like the ones in the review stories proudly displayed on the wall near the restrooms, the kitchen was concocting dazzling sculptures so beautiful I imagine it was difficult to take that first bite. For whatever reason, be it the formality or the price of the tasting menus, despite excellent reviews, Washington didn’t bite, as least not enough for the restaurant to make money. So Elisir was transformed into Osteria Elisir, a casual Italian trattoria with an a la carte menu of antipasti, pasta and meat and seafood entrees. The tables were bared. The walls were repainted in shades of brown and decorated with mirrors and half wine barrels. I never visited Elisir in its original formal incarnation but was pleased to enjoy dinner there recently, about a month into its casual transformation. The food may not have been as artful as it once was, but it was still quite good. Tender porchetta infuses a bowl of tagliolini pasta with smoky, salty flavors augmented by a conservative sprinkle of smoked mozzarella and bitter arugula. The stringy noodles have a rough texture like they were hand-cut and reminded me a bit of ramen actually. Although the rigatoni doesn’t appear to also be homemade, it has good texture and flavor, graced with a mushroom-rosemary sauce and pieces of burrata, which is interesting to find in a pasta instead of by itself as a starter where I’ve usually encountered the creamy mozzarella. The beets in our salad starter were superb, served with mâche greens, oranges, goat cheese and fried artichoke chips. We also had artichoke in our other starter, roasted this time and served with a mix of bell peppers, fennel, frisee, olives and capers. This was good too, although the most pedestrian of the dishes we sampled. Artichokes also appear on the menu fried with lemon, mint, garlic and anchovies. As a big fan of olive oil, I couldn’t pass up the olive oil and sea salt sampler to accompany our bread basket. It featured a trio of oils from Liguria, Tuscany and Sicily and three accompanying sea salts infused with black olive, red wine and basil. The oils were all quite good and I particularly liked the basil salt, although I couldn’t detect much flavor in the red wine salt. Our meal ended well with a tasty warm almond cake served with ricotta gelato and prosecco-pear gel. As good as the food was, I wish the service had been better. While our server was quite friendly, there appeared to be something amiss in the dining room, as he seemed to be a bit harried. That Elisir really overdoes the “whisk away” move only added to the sense of rush that surrounded dinner. My cocktail was removed with about a fourth of it left, and I probably would have eaten that last olive in our salad if given the chance. Annoyingly, the also employed the irksome practice of removing one diner’s plate before the other is finished, a move I wouldn’t have expected at a restaurant of this caliber. As fast as things were moving in the dining room, apparently the opposite was going on at the bar, as drink orders (our and our neighbors’) took quite some time to materialize (for which our server kindly made up for with a comped glass of wine). When Elisir opened, it generated a significant amount of buzz and excitement. Despite the difficult time it may have had, I can’t help but wonder whether, in its new incarnation, things will be any easier. By moving from formal-modern to casual-elegant, the restaurant put itself in direct competition with a number of other fine Italian upscale-casual establishments downtown, such as Fiola and Bibiana. If the dishes at Osteria Elisir were able to retain some of the restaurant’s prior modernist flair, I think it would be on to something, but its current menu, while well-made, doesn’t have that sort of distinction. Osteria Elisir, 427 11th Street NW (between Pennsylvania Ave. and E Street NW), Washington, D.C. (Metro Center). (202) 546-0088. Reservations: Open Table. Spring has arrived, but as lamented recently by The New York Times, that doesn't necessarily mean spring produce is available. It's starting to appear though: I saw fresh strawberries at the supermarket this week and the asparagus is looking great. The really good selection won't arrive for me until June, when my local farmers market returns from hiatus. Until then, I'm stuck with supermarkets (or farmers markets further afield). That's not necessarily so bad. Even pretty typical produce can be satisfying if made well. When it comes to supermarket produce, carrots and celery are always available and generally in great quantities. Using it up can be a challenge, particularly the celery. 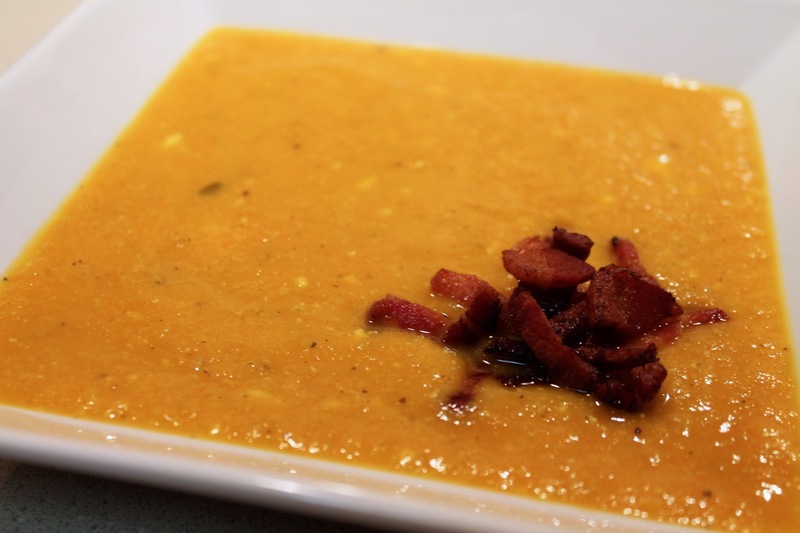 Cynthia Damico, a frequent contributor to the blog A Reluctant Foodie, offered up this simple carrot soup last year. I followed a few of her suggestions for switching it up: adding sweet potatoes, seasoning it with tarragon and finishing the soup with Greek yogurt. 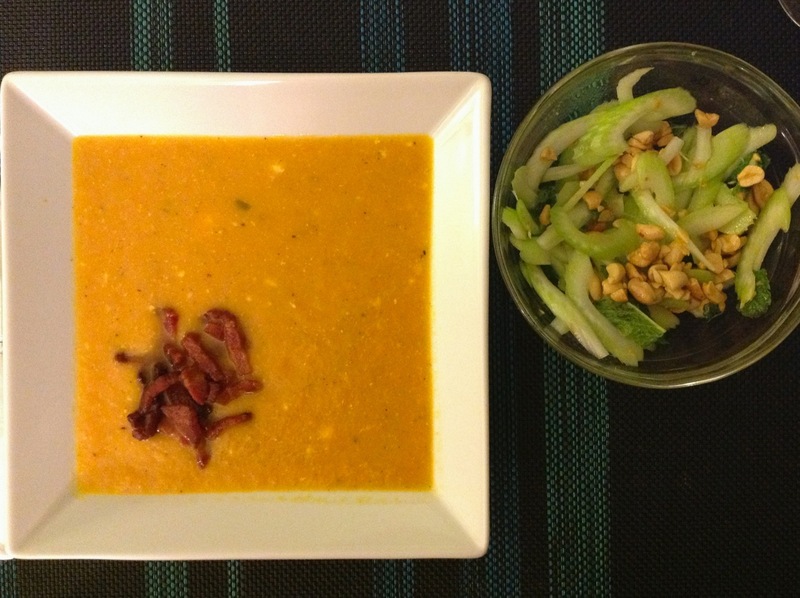 I paired this soup with a Celery and Peanut Salad inspired by the popular celery stick with peanut butter snack. 1. Heat butter and olive oil in a Dutch oven over medium heat. 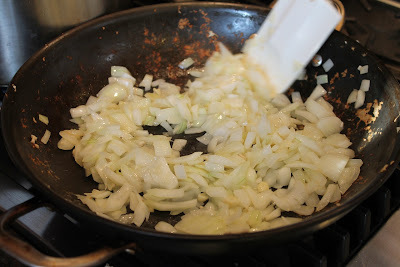 Add onion, shallot and garlic, season with salt and cook until softened, about 6-8 minutes. Add carrots, sweet potato, tarragon and thyme, stirring to combine with onion mixture and cook for about 5 minutes. Add chicken stock and water, increase heat to bring to a boil, reduce heat and simmer for 30 minutes. 2. Heat a medium frying pan over medium heat. Cook bacon lardons, remove with a slotted spoon and transfer to a paper towel-lined plate. 3. Add pepper to soup. Puree with an immersion blender until smooth. Remove from heat and stir in Greek yogurt. Serve in bowls topped with bacon. To accompany my Carrot-Sweet Potato Soup with Bacon and use up that other perennial vegetable--the celery--I concocted this simple salad inspired by the classic snack of celery sticks with peanut butter. Combine celery and mint in a medium bowl. Whisk together oil, vinegar, honey and salt. Pour over celery and toss to combine. 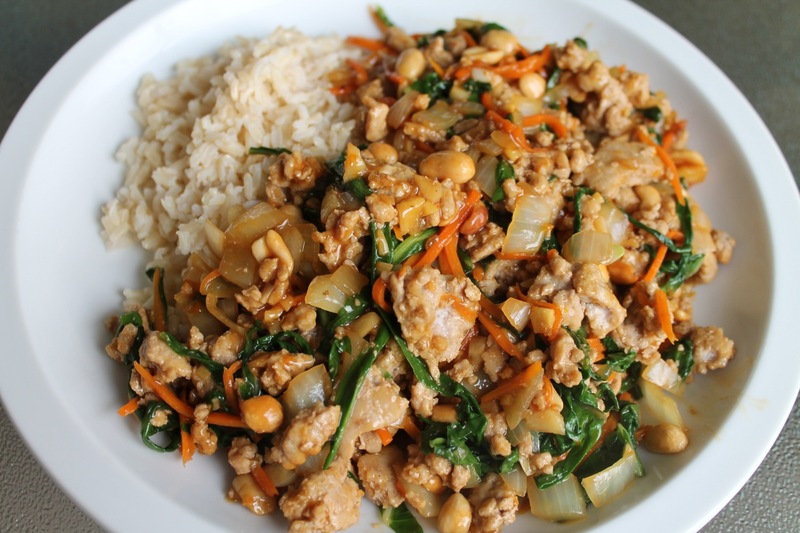 Top with chopped peanuts. Washington Post: “The Washington Post Cookbook,” by Bonnie S. Benwick. Three cheers to Bonnie Benwick, who is deservedly pleased to see the publication of the Washington Post Food section’s first cookbook, an effort she oversaw last year while serving as interim Food editor when Joe Yonan was on hiatus (a task she exceled at, as evidenced by the Post’s win in my Food (Section) Fight! last year). Benwick provides a nice preview of the book, out this week, which is comprised of recipes from the Post’s archive chosen by readers. U.S. News and World Report: “You’ll Gladly Die for Your Children; Why Won’t You Cook for Them?” by Yoni Freedhoff. Echoing themes from Michael Moss’s Salt Sugar Fat, Freedhoff examines why many parents too often turn to unhealthy convenience and restaurant food for feeding their children and offers some suggestions for how to change this. Washington Post: “Greek salad days,” by David Hagedorn. Hagedorn presents an insightful look at the Greek salad, describing its classic form (horiatiki) and some modern twists courtesy of D.C. chefs serving Greek-inspired plates, including Mike Isabella, whose Greek eatery Kapnos is due to open soon. The best part of this article is the revelation that the new chef at Ripple is planning a hybrid panzanella-Greek salad featuring fried bread with garlic and thyme. I’ll definitely be heading there this summer. He includes some great recipes, including his take on the horiatiki and dakos, a Cretan salad similar to panzanella. New York Times: “Ice Cream’s Identity Crisis,” De Gustibus by Dan Barry. Salon: “Sustainable pork farming is real,” by Barry Estabrook. Salon profiles Missouri pig farmer Russ Kremer, whose farm that uses sustainable methods to farm pigs was the inspiration of Chipotle’s recent memorable ad. It’s an interesting story about why Kremer abandoned more industrial methods of raising pigs after it almost killed him. The Kitchn: “12 Food Writers Share Their Favorite 3-Ingredient Cocktails,” by Faith Durand. While I have no fear of wild cocktail concoctions, sometimes it’s nice to keep it simple. The Kitchn has assembled a great list of easy classics like the Negroni, Moscow Mule and “Pink” Gin. The Atlantic: “Look How Quickly the U.S. Got Fat (1985-2010 Animated Map),” by James Hamblin. It’s clear that obesity is a serious problem in America. This animated infographic shows just how quickly this has spiraled out of control: in the late ‘80s, there were no states with obesity rates above 15 percent; in 2010 there were no states with obesity rates below 20 percent. Yikes. Today is the Day of the Mushroom, an apt time for this food holiday to come along when mushroom fanatics are busy foraging for all sorts of unusual varieties of fungi. Originally, I had planned to celebrate this day with Funghi Calabresi from the Mario Batali Cooks mobile app. But the recipe was so poorly written that I was not entirely sure what I was doing was correct. The results were fine, but not Day of the Mushroom-worthy. Shoot for "honey-colored" when roasting the pasta flour. Thankfully, the April issue of Food & Wine has a great recipe to showcase mushrooms: Toasted Fazzoletti with Chanterelles and Hazelnuts. 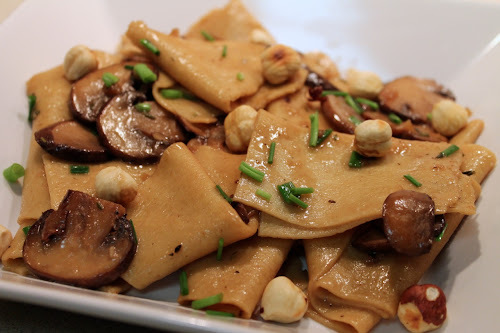 The toasted pasta flour and nuts complement the mushrooms' earthiness. And Fazzoletti is one of the easiest pastas to make at home, since it requires no precision cutting. You may cut the fazzoletti precisely, but I prefer irregular shapes. The homemade fazzoletti takes some time to make due to several steps of resting time for the dough, so be sure to plan ahead to allocate enough time. The dough recipe was a little challenging, but not insurmountable. Be sure to watch the flour while it roasts, since it could burn. I removed mine from the oven a little earlier than the recipe called for, since I was concerned it could smoke. Don't leave the cooked fazzoletti in a bowl too long before adding to the sauce, as they will stick together. Another challenge with the dough was getting the consistency right. When it came time to roll it out in a pasta machine, it was really sticky. As I kneaded the dough, I added a generous amount of additional flour. After it seemed the pasta flour alone wasn't going to produce a smooth enough dough, I added all-purpose flour, which made the dough a little softer and thus easier to work with. 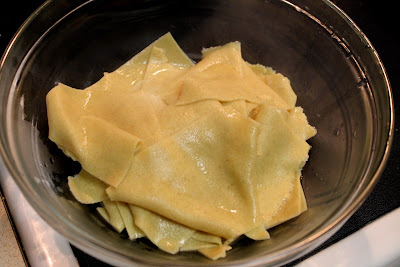 As I mentioned earlier, fazzoletti are easier to deal with than say linguine or fettuccine, in part because you can just cut the dough into random squares. The recipe called for making 2-inch squares, but rather than discard a lot of little pieces, I made mine more irregular. In the final dish, when the pasta ends up folded into random shapes anyway, it doesn't matter how perfect they are. In fact, I rather like the more rustic look of their irregularity. Be sure not to cook the noodles ahead of time, since they will stick together (prying apart hot noodles is a pain--speaking from experience here). Although chanterelles were used in the original recipe, I made it with more common cremini mushrooms. Mushroom aficionados will want to use the chanterelles as called for in the recipe or another interesting mushroom. Unfortunately, Whole Foods stopped their unusual mushroom promotion the weekend I was buying ingredients for this dish, so I had to settle for cremini mushrooms, which were still quite delicious. 1. Preheat the oven to 375 F. Spread the hazelnuts in a pie plate or on a baking sheet and toast for 12 minutes, until the skins split and the nuts are fragrant. Allow the nuts to cool a bit, then transfer the nuts to a clean kitchen towel, fold the towel the nuts and rub the nuts vigorously between the two layers of towel to remove the skins. Coarsely chop the nuts, if desired (I left mine whole). 2. 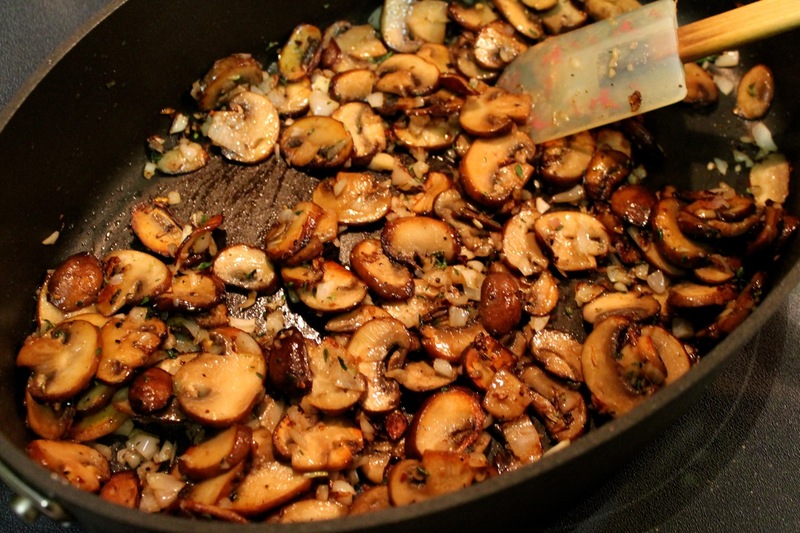 In a large, deep skillet, cook 4 tbsp. of the unsalted butter over moderate heat until lightly browned, about 3 minutes. Add the mushrooms, season with salt and pepper and cook over medium-high heat, stirring occasionally, until all of the liquid has evaporated and the mushrooms are golden, about 8 minutes. Add the shallot, thyme and crushed red pepper and cook over moderately high heat for 5 minutes, stirring frequently. 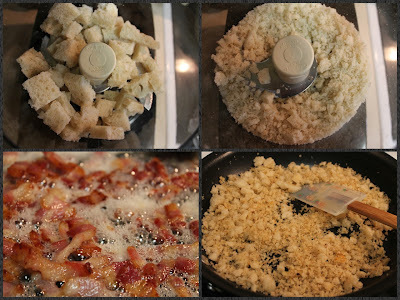 Add the vinegar and cook until evaporated, scraping up any browned bits from the bottom of the skillet. Add the stock and simmer until reduced by half, about 10 minutes. Season to taste with salt and pepper. In a large pot of salted boiling water, cook the fazzoletti until al dente, about 3 minutes (I recommend cooking them in two batches to avoid crowding the pot). Drain and add the pasta to the skillet, along with the remaining 2 tbsp. of butter. Cook over moderate heat, stirring, until the pasta is coated with butter. Stir in the chives and serve in shallow bowls, garnishing with the toasted hazelnuts. 1. Preheat the oven to 375 F. Spread 1 cup of the flour on a baking sheet and toast for about 30 minutes, stirring once, until fragrant and honey-colored (I pulled mine a little sooner, about 25 minutes total). Let the flour cool. 2. In a food processor, combine the toasted flour with the remaining 2 cups of flour and pulse. With the machine on, add the eggs, milk and salt and blend until the dough comes together; turn out onto a floured work surface and knead 2 or 3 times to form a soft, supple dough. Wrap the dough in plastic and let stand at room temperature for 2 hours. 3. Cut the dough into smaller pieces (judge this based on your pasta machine; the original recipe said 4 pieces, but I did 8, since that worked better in my pasta machine). 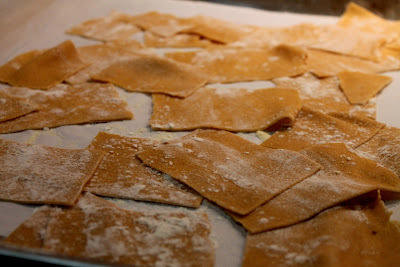 Using a pasta machine on the thickest setting, run 1 piece of dough through the machine, dusting with flour. Fold the dough in thirds and run it through the machine at the same setting. Continue to run the dough on successively thinner settings until you are 1 setting from the thinnest (I made the dough a little thicker than this--setting 4 on a Kitchen Aid pasta machine). Dust the dough with flour and drape over a floured work surface while you repeat with the remaining dough. Cut the pasta into 2-inch squares and dust lightly with flour. Let the squares stand at room temperature for 1 hour, tossing occasionally. A few weeks ago I did something I hardly ever do. I ate a Cheeto. And not just one, of course, but the whole bag, since how do you stop with just one? Or even 21, which is a single serving as defined by Frito-Lay, delivering 150 calories from 10 grams of fat, 13 grams of carbohydrates and 2 grams of protein, plus about 10 percent of the recommended daily allowance of sodium and just a trace of fiber. Its ingredients include whey protein concentrate, monosodium glutamate and “cheese seasoning.” A Cheeto may be orange, but it’s no carrot. Why did I do this? I’d just read “The Extraordinary Science of Addictive Junk Food,” a New York Times Magazine article by Michael Moss that preceded the recent release of his book, Salt Sugar Fat: How the Food Giants Hooked Us. In the article, he talked with a former Nestlé food scientist about what makes Cheetos so appealing. The scientist honed in on the product’s “vanishing caloric density,” a phenomenon of the food melting in your mouth in a way that tricks your brain into thinking the food has fewer calories, allowing you to eat more before becoming satisfied, a trick Moss compares to popcorn. It’s the sort of anecdote that makes Salt Sugar Fat an appealing mix of nutrition-minded facts about familiar junk food brands augmented with first-hand insider information that gets behind the “it’s bad for you” rhetoric we all know to be true and into the reasons why, nonetheless, we still crave it. Moss argues the key to these cravings are the foods’ balances of sugar, fat and salt, which processed food companies carefully formulate to achieve the “bliss point,” that right mix of taste and texture that will attract the most consumers. Each of these ingredients acts on consumers differently, and it was fascinating to learn about this. Sugar, for example, is more attractive to children than adults, and there’s a point to which consumers start to like a product less when it has too much sugar. Getting the sugar right is important, since this is the element in the trio that will “hook” you, unfortunately quite literally for some over-eaters who must swear off sugar to counter obesity. Fat, in contrast, has no bliss point—the more fat the better. Salt is perhaps the most elusive one, given that it’s not really a food (it’s a mineral and therefore contains no calories). I was already aware that salt is a flavor that your palate can become used to, requiring increasingly greater quantities for you to really taste the saltiness (I’ve read this is why some chefs are prone to over-salting their food). What I didn’t realize is how this state isn’t permanent. Anyone who craves salty snacks need only abstain for a period of time and their craving for salt will go away. Once pleasurably salty foods will, with time, taste over-salted, an experience I had eating McDonalds after years of swearing off such fast-food restaurants. Some may be surprised to find that many of the industry insiders Moss spoke to do not eat the snacks they helped to perfect. Some purposefully avoid them, while for others, junk food is just not part of their lifestyle. After all, these are highly paid executives, and it’s an unfortunate truth that unhealthy food is most consumed by—and therefore most targeted to—lower income brackets. It costs more to eat a diet of varied fresh fruit, vegetables, lean meats and whole grains from farmers markets and upscale grocers than it does to subsist on processed convenience foods from the corner store. These economic issues have been touched on before, most effectively by Tracie McMillan in The American Way of Eating but also Michael Pollan in The Omnivore’s Dilemma. While Pollan suggested that Americans should be willing to pay more for their food to eat better, McMillan rightly pointed out the unfairness of this, given that Americans pay more for other services (like childcare) than other countries. While Moss’ book gives good context to these broader socio-economic issues, its greatest value lies with its insider views, particularly the insights into the foods’ science. Overconsumption is a key concept in Salt Sugar Fat. Moss writes about how companies, particularly the soda makers, target their marketing to “heavy users,” people who already use their product a lot that they believe they can sell more to. It’s easy to see how this has played out at the store. As a kid, I remember soda was sold in single-serving cans (12 oz.) and bottles (16 oz. ), and the multi-serving two-liter size. Today, 7-Eleven sells a Double Gulp—a serving meant for one person—that’s 64 ounces, almost as much product as the two-liter package once meant to serve a group. A 64-oz. Coke contains the equivalent of 44 teaspoons of sugar, nearly 1 cup or as much as I would put in a batch of cookies. When Americans can so easily buy a 64-oz. Coke but have limited options for buying fresh carrots (see the USDA’s new food deserts map), it’s no wonder that obesity continues to be a problem. With increasing healthcare costs that can be linked back to diet (diabetes, hypertension and heart disease, to name a few now common afflictions), something must be done to get Americans out of the convenience store and back in the kitchen. Moss isn’t offering any solutions, but it’s a wonderful contribution to the “problem definition” discussion that those concerned about how we eat are having these days. April is Grilled Cheese Sandwich Month, and in fact April 12 is Grilled Cheese Sandwich Day, so it is most appropriate today to celeberate this cheesiest of national food holidays. Grilled cheese is something people can get pretty particular about. I have a friend who swears they are best made with cheap white bread and processed American cheese. On the opposite end of the spectrum, there are quite a few gourmet incarnations with added meats, vegetables and an assortment of cheese and bread combinations. Personally, I fall somewhere in the middle. I like to keep it simple but use really good ingredients. My favorite grilled cheese sandwich uses buttered good sourdough bread and a mix of gruyere and sharp white cheddar cheeses. I like to mix it up though; the sandwich picture above uses 12-grain bread, for example. See that little bit of cheese on the right that fell off the bread? You know when that gets crispy that it's going to be awesomely good. Assembling the sandwich carefully is very important. Although shredded cheese will melt easier, I find that makes a real mess when it's time to flip the sandwich. Instead, I prefer layering small, thin slices of cheese, alternating between the gruyere and the cheddar. The cooking technique is also important. 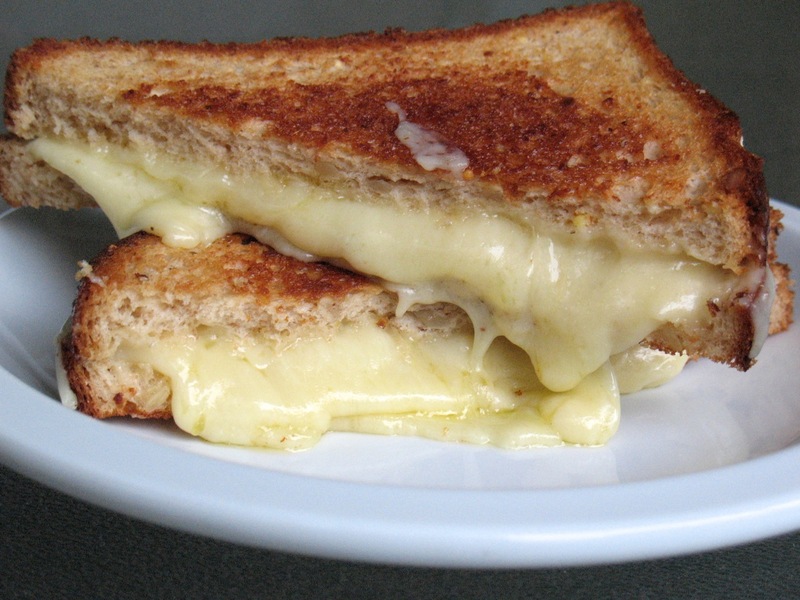 If you cook the sandwich too fast, the bread will toast before the cheese has a chance to melt. I like to start with a cold frying pan set over medium-low heat. So the first side spends a lot more time cooking than the other side, but this allows the sandwich to slowly come up to temperature, giving the cheese a chance to melt. For added flavor, I like to borrow a few moves from another cheese favorite: traditional Swiss cheese fondue. I swipe a raw cut garlic clove across the surface of the pan before I heat it. Then, as I layer the cheese, I add sprinkle of ground nutmeg and fresh ground white or black pepper. A sprinkle of truffle salt would be good too, but that might be getting too fancy. 1. Rub the cut side of the garlic clove on the bottom of a frying pan. Set over medium-high heat. While the pan is still cold, spread 1 tsp. butter on one side of one piece of bread and lay in the pan buttered side down. Layer the cheese on top of the bread, alternating between types and adding a sprinkle of nutmeg and pepper about halfway through. Place the other piece of bread on top and spread the other tsp. of butter on top of that piece. 2. 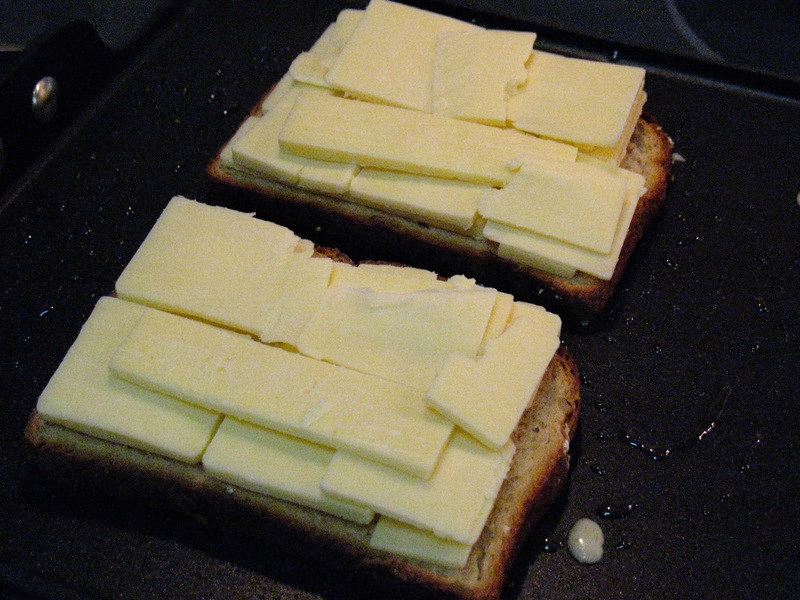 Cook the sandwich until the cheese starts to melt and the bottom piece is nicely toasted, about 10 minutes. Carefully flip the sandwich over and continue cooking until the other piece of bread is toasted, another 3-5 minutes. Remove from pan and slice in half. Be sure to eat any bits of cheese that escaped the sandwich and browned in the pan. Like asparagus, peas are another vegetable that is quintessentially spring and they find a nature partner in fresh mint. To use up the peas I bought for the Salmon with Asparagus, Lima Beans and Peas, I thought it would be interesting to do something with Asian flavors. 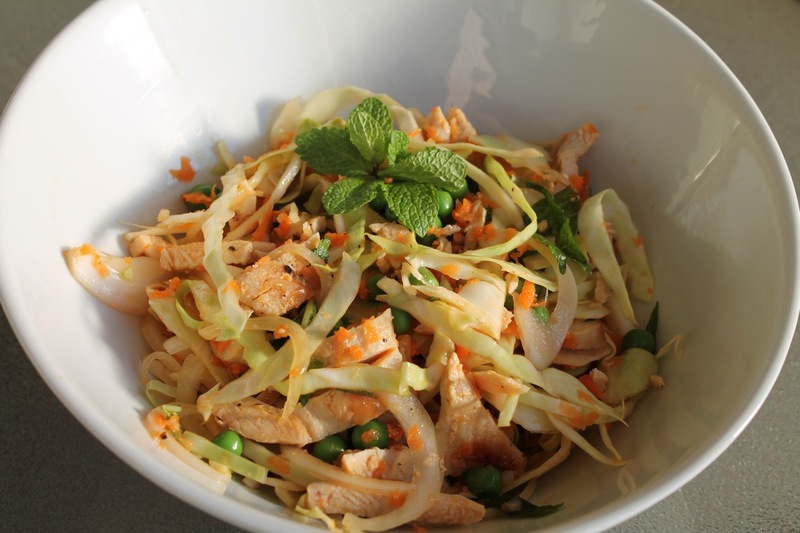 I found this recipe for Vietnamese Chicken Salad with Mint by Nigella Lawson, star of Nigella Kitchen on the Food Network and thought that peas would also work well in the dish. Don’t be put off by the fish sauce. A lot of Southeast Asian dishes have it. Despite how pungent it is on its own, it disappears into the dish once it’s all mixed together. Consider this: if you’ve eaten Pad Thai, you’ve probably had fish sauce. The other big change I made was to omit the Thai chile and instead spiced my bowl with a few squirts of sriracha, a Thai hot sauce, allowing Chris to keep his salad mild. 1. 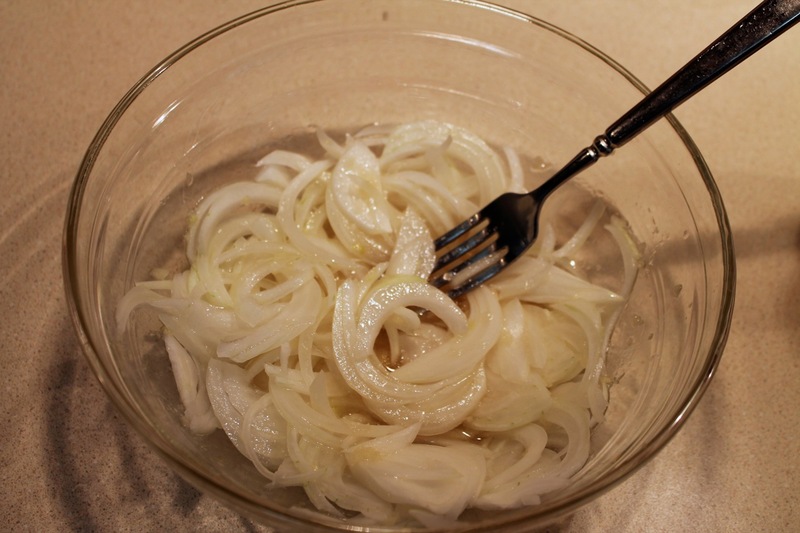 Add onion to a medium bowl. Whisk together garlic, sugar, vinegar, lime juice, fish sauce and remaining 1 ½ tbsp. oil and pour over onion. Set aside for ½ an hour. 2. Heat 1 tbsp. oil in a medium frying pan over medium heat. Pat chicken dry, season with salt and pepper and sauté until browned and cooked through, about 10 minutes, flipping halfway through. Set aside to cool and then cut into narrow strips. 3. Fill a 4 qt. saucepan halfway with water and place over medium-high heat. Bring to boil, add peas and cook for 3 minutes. Transfer cooked peas to an ice water bath to chill. 4. In a large bowl combine cabbage, carrot, chicken breast, peas and mint. Pour onion-dressing mixture over salad and toss with tongs to combine. Serve topped with extra mint for garnish and, if desired, a few squirts of sriracha. The Oregonian: “Welcome 'Mad Men' season 6 with 1960s-themed party snacks, cocktails: Foodday Favorites,” by Grant Butler. AMC’s stylish drama series Mad Men returned for its 6th season Sunday, sending lovers of nostalgic party food back to the ‘60s for Mad Men-era snacks and drinks. The Oregonian’s Foodday took a nice approach: resurrecting its own recipes from the 1960s but putting a modern spin on them, like updating cheese ball with smoked paprika and marcona almonds. Also in the Mad Men vein, although with a caution, as Brown discusses how cocktails were definitely trending downward during the ‘60s. He offers suggestions for how to improve Mad Men-era drinks, such as omitting the “fruit salad” from an Old Fashioned (I prefer just an orange peel myself). If I told you my blog was a “nuclear free zone” would it make you want to read it more? The SlowMoneyFarm blog uses the recent example of the Florida DJs who got in trouble for telling people their taps were dispensing “dihydrogen monoxide” (a.k.a. “water”), to point out that food producers can use the truth in misleading ways to sell their products. For example, labeling popcorn as free of genetically modified corn in hopes of selling to the anti-G.M.O. crowd when no popcorn is G.M.O. in the first place. I’ve seen this with chicken: producers claiming it’s hormone free when no chickens are raised with added growth hormone since they aren’t approved for that use. New York Times: “Why Do G.M.O.s Need Protection?” by Mark Bittman. Speaking of G.M.O. Bittman is known as a recipe genius and champion of simple cooking, but here he takes an editorial stance, calling a recent move by Congress to protect producers of genetically modified foods “unnecessary as well as disgraceful.” According to Bittman, the law in question prohibits the Department of Agriculture from stopping production of a genetically engineered crop, even if it’s found to be harmful. Washington Post: “Homemade crackers, in no time flat,” by Jane Touzalin. Think making homemade crackers is difficult? Touzalin discovers its really quite simple and a much more economic way of getting your hands on “artisan” crackers. This recipe, for example, uses only flour, sugar, salt, baking powder, butter and water and sounds like it takes about 30-40 minutes. New York Times Magazine: “True Tales of Hell in the Kitchen,” by Jessica Gross. They may be professional, but top New York chefs have suffered mishaps too. Here’s a collection of 10 amusing anecdotes from restaurants like B. Smith, Perilla and Anissa.